A woman filmed the moment she saw the ‘face of Jesus’ in a rock formation as she was walking down a trail last month. Shae House, from Virginia, claims to have seen the religious figure’s face in a rock while walking along the Blackwater Creek trail in Lynchburg. Shortly after filming her discovery, House posted the video to social media to share what she saw, claiming she had ‘found Jesus’. In the video, House explains how she stumbled across the ‘face’ when she was taking some pictures on a walk and said it was ‘just by chance’ she captured the images. I wanted to take some beautiful pictures, it’s a beautiful spring day, and I look up and I’m taking pictures of the rocks, and I swear I see Jesus on this rock. A face, and I didn’t even see it until I looked into my camera lens and I said ‘woah!’ That looks like a face, then I looked at it more clearer and I’m like, well that just looks like Jesus. House went on to say how Jesus could only be seen at a certain angle, moving her camera and walking along the path so everyone could see what she was seeing. You can only see it kind of at an angle. Watch this, it kind of changes as I walk by. You see that? So it’s just by chance I just held my camera up at that angle. It wasn’t until after she looked at her pictures that she realised what she had stumbled upon, and immediately looked through her camera lens to get a better look. House told WSET she entered the trail from the Ed Page entrance behind the Greek Orthodox Church, but never expected to see Jesus. I gasped and then eagerly started to take more pictures. I was delighted. I was listening to my praise and worship music on my phone and was praising God humming, I just didn’t think I’d see God. The woman said she was in awe of the crown of thorns and thick mustache she could see on the ‘face’. So what do you think? Jesus or just a big ol’ pile of rocks? Jesus found in Lynchburg VA! 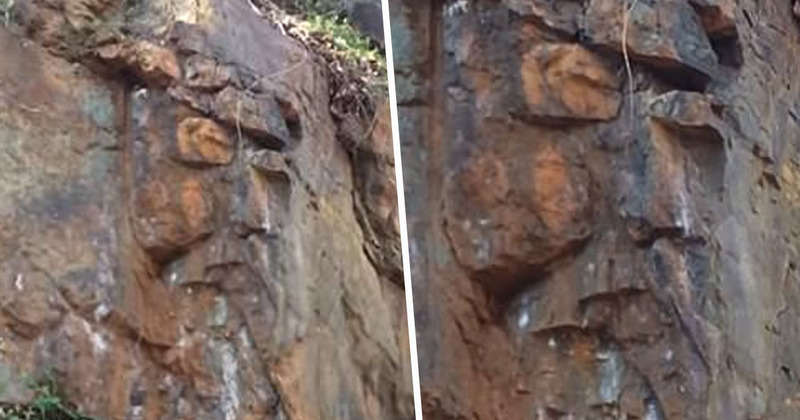 Woman spots image of Jesus along Lynchburg trail, do you see it?